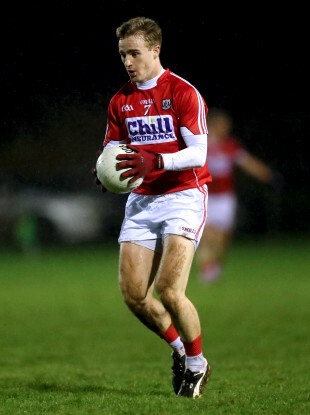 Cork's Matthew Taylor got the game's only goal (file pic). THOSE PAYING the full whack of £19 in to this game may not have been able to believe their eyes as the home side went the entire first half without scoring from play, Conal Jones’ fourth minute free opening the scoring for Fermanagh, while after that Cork gradually took control and edged themselves into a 0-4 to 0-1 lead at the break. It took just two minutes for Fermanagh to double their first half scoring tally as the second half got underway, Aidan Breen and Declan McCusker popping over scores from medium range. That such deep-lying players were able to do so, was down to the depth of attack. In lay man’s terms, the home side had nobody up front in the first half. As in, nobody. The odd thing was, neither did Cork as both pulled 15 men behind the ball, making a deeply unsatisfactory contest of football. With a change of shape at the break, and then a second yellow card for Ruairi Deane, Fermanagh strung together a few points to go 0-7 to 0-5 up. Just when they looked to have the visitors sussed, an Ian Maguire handpass slipped Matthew Taylor through and he hit the net. Eight second half wides and two efforts dropping short for Rory Gallagher’s men said it all and they rescued a point in the final play of the game. Ryan Jones managed to intercept a freekick and instantly kicked to brother Conal who took his offensive mark. A retreating Cork defender slapped the ball out of his hands so referee Anthony Nolan brought the ball in to a more advantageous position. Conal Jones nailed it, and the points were shared. Email “Cork and Fermanagh can't be separated in low-scoring affair”. Feedback on “Cork and Fermanagh can't be separated in low-scoring affair”.